Searching for a needle in mountains of data! Integration of data from multiple sources is one of the main issues that the database and artificial intelligence research communities are facing. The approach typically adopted for integrating information sources aims at building a mediated schema (called also global schema) that allows a user to query multiple heterogeneous data sources (RDBMS, html documents, plain text and XML files) by means of a single query over the global schema. Though the global schema handles heterogeneity issues, it is often composed of a large amount of related tables, and it is hardly readable for a user. On the other hand, traditional query languages strongly rely on the knowledge of the source schemas. In this project, we aim at developing a query language and the related keyword-based query engine supporting users in querying data sources with complex and large schemas, such as global schemas. From the architectural point of view, the search engine will be designed to be an add-on to allow querying generic relational databases, in particular personalized to be used coupled with mediator-based integration systems, like the MOMIS Integration System. Francesco Guerra, Sonia Bergamaschi, Mirko Orsini, Antonio Sala, Claudio Sartori: Keymantic: A Keyword-based Search Engine using Structural Knowledge. ICEIS (1) 2009: 241-246. Sonia Bergamaschi, Elton Domnori, Francesco Guerra, Raquel Trillo Lado, and Yannis Velegrakis. 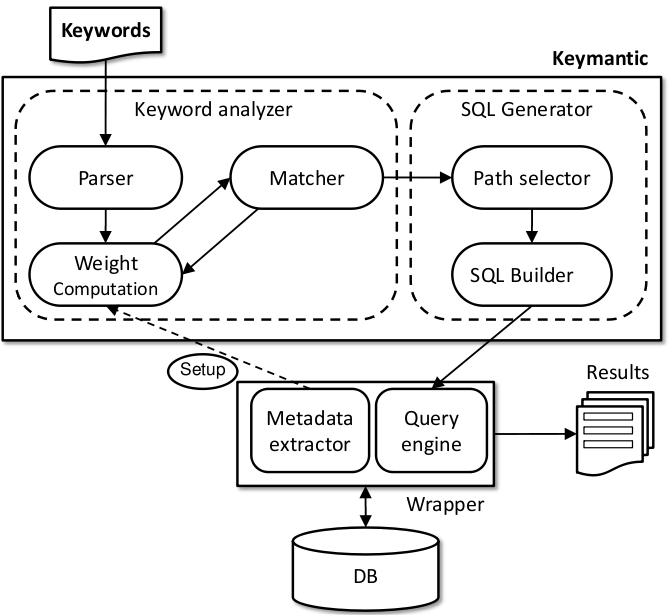 Keyword Search over Relational Databases: a Metadata Approach. In Proc. of SIGMOD 2011, Athens, Greece, June 12-16. ACM, 2011. Sonia Bergamaschi, Francesco Guerra, Silvia Rota, and Yannis Velegrakis. Understanding Linked Open Data through Keyword Searching: the KEYRY approach, 1st international workshop on linked web data management (LWDM 2011) in conjunction with the 14th EDBT 2011, Upsala, Sweden - March 21-25, 2011. Sonia Bergamaschi, Elton Domnori, Francesco Guerra, Raquel Trillo Lado, and Yannis Velegrakis. Keyword-based Search in Data Integration Systems. Extended Abstract, SEBD 2011. Sonia Bergamaschi, Francesco Guerra, Silvia Rota, and Yannis Velegrakis. A Hidden Markov Model Approach to Keyword-based Search over Relational Databases. In ER, 2011. Sonia Bergamaschi, Francesco Guerra, Silvia Rota, and Yannis Velegrakis. KEYRY: a Keyword-based Search Engine over Structured Sources based on a Hidden Markov Model. In ER2011 (Demo). Silvia Rota, Sonia Bergamaschi, Francesco Guerra. The List Viterbi training algorithm and its application to Keyword Search over Databases. In CIKM, 2011.